Among the most expensive Apple headphones available on the market, the Beats Solo3 are now on sale at Best Buy and Amazon. Both US retailers have nearly similar deals on the wireless headphones, but Best Buy's price is the only one that slightly drops below $200. For a limited time, Beats Solo3 wireless headphones can be purchased via Best Buy for just $199, although they usually sell for around $300. Amazon has the same headphones on sale for $202, so there's not much of a difference between the two offers. It's worth mentioning that customers can choose from no less than thirteen color options. The bad news is it's unclear when the promotion is supposed to end, so you should definitely hurry if you want to get them. Apple's Beats Solo3 wireless headphones promise to offer up to 40 hours of battery life. Moreover, thanks to the Fast Fuel technology, a 5-minute charge gives the user 3 hours of playback. The box includes a 3.5mm RemoteTalk cable, a carrying case, a universal USB charging cable (USB-A to USB Micro-B) and a quick start guide. 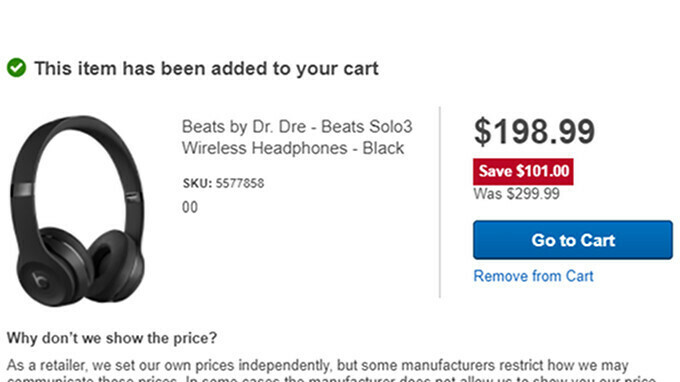 Come on man its Apple+Beats , how can you expect it to be correctly priced.